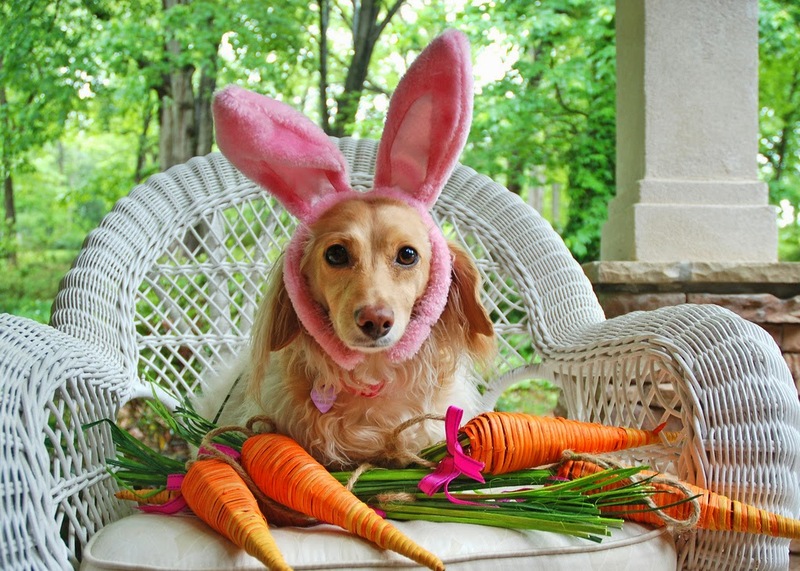 It's Easter and our thoughts are turning to bunnies. And benches, of course. Here is April, age six, on a bright yellow bench, along with her parallel selves, May and June. The three girls are thrilled to meet The Easter Bench Bunny. He has brought along quite a few friends; you know how rabbit benches multiply. 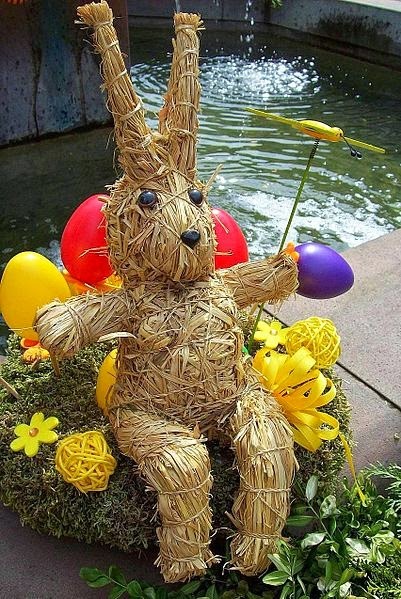 Here is a lovely straw bunny on his Easter bench. Milo has found this bench just a bit too small to meet her Easter needs. Where on earth is she going to put her chocolate bunnies? 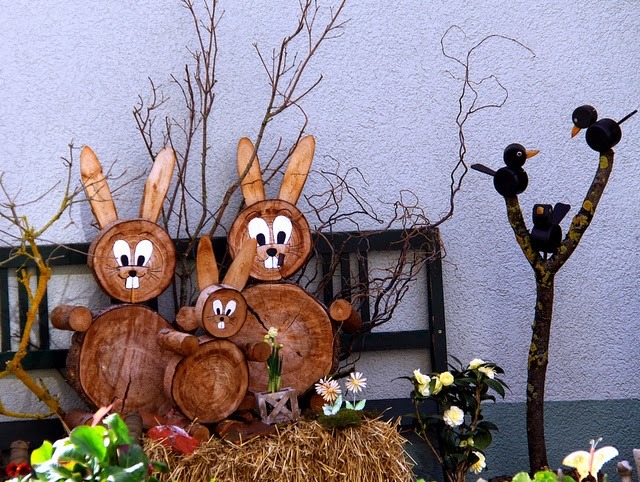 These bunnies from Switzerland seem to have found a nice roomy bench of their own. 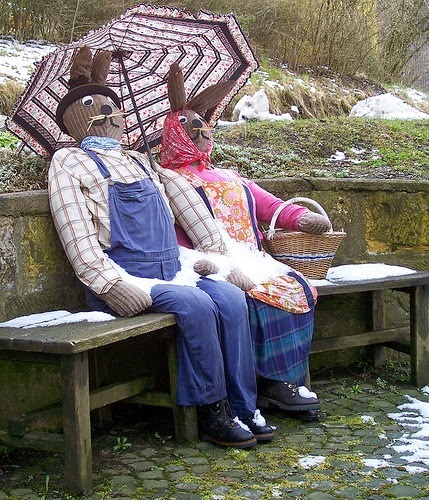 And here's a lovely rabbit couple on their bench. She's wearing her Easter bonnet and her best green dress. They're setting out with their shopping basket to get some Easter treats. April, May and June prefer cupcakes. Here they are hanging out at Miggy's Make a Wish Cafe. As you can see from the door, the word 'cafe' isn't very accurate since mainly Miggy's Make a Wish is about cake. I explain to the girls that cake is no treat for rabbits; rabbits prefer carrots. April is saying there is something odd about this rabbit. Her ears are rather too pink. This one too seems a little unusual. Do many rabbits wear sunglasses? Indeed it seems they do. May is pointing out that this little white rabbit isn't on a bench. And in fact the rabbit with the pink ears isn't on a bench either. June is saying she thought this was meant to be a blog about benches. Rabbits, yes, but benches. She wants to know where the rabbit benches are. Perhaps we can find some. 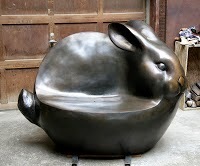 Well, there is no shortage of rabbit benches, that's for sure. 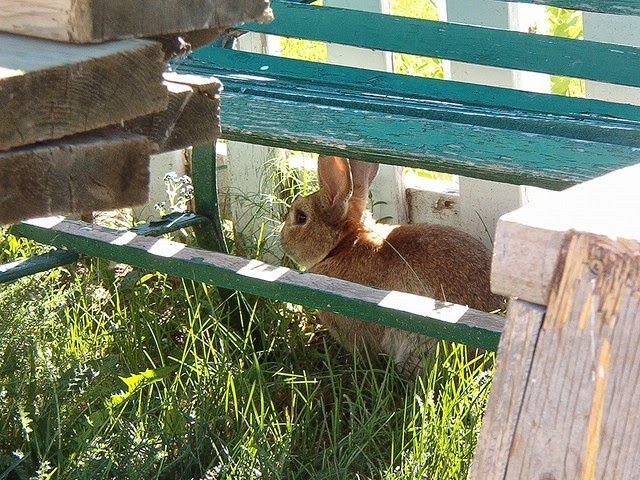 Here's a lovely bunny under a bench. 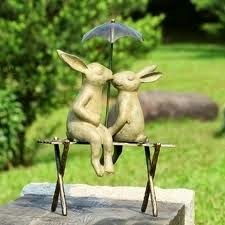 And here's a romantic bunny couple who have come prepared for rain. Years pass and the couple get older and not quite so loved up. The girls are protesting loudly now. They demand to see some rabbit benches. April: Not rabbits on a bench. May: Not rabbits under a bench. 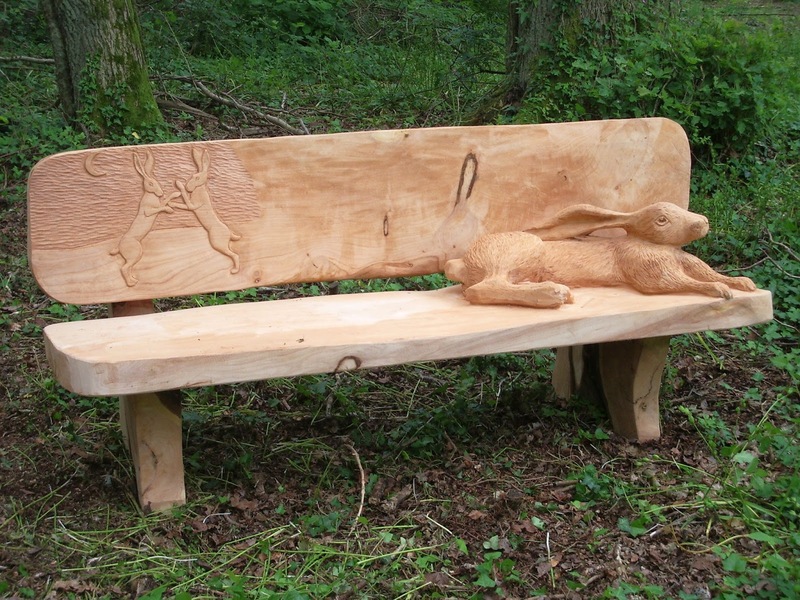 June: An actual rabbit bench. Personally, I think this is just splitting hares. Did you know that in the past the British hare was the animal that all men scorn? Even saying its name was considered unlucky, which is why there are so many other names for it: dew-beater, grass nibbler, fast traveller, stag of the cabbages. April: I didn't know that. June: We don't want hares. We want rabbits! OK, fair enough, girls. 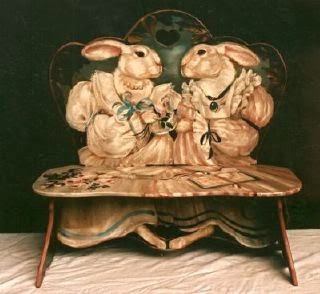 I'll hold up my side of the bargain and show you some rabbit benches. 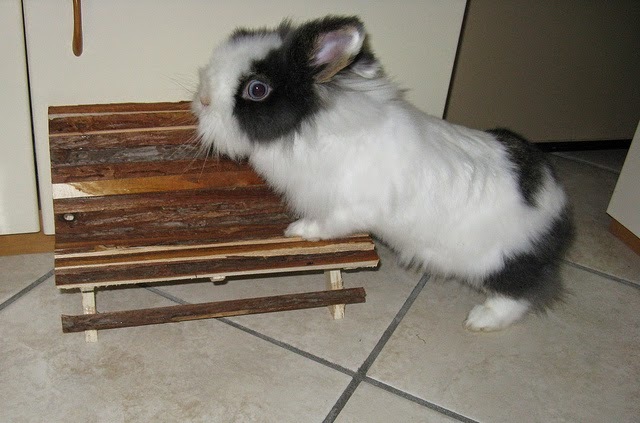 April thinks this bench might be too heavy for this little rabbit. She thinks this bench is rather cruel. 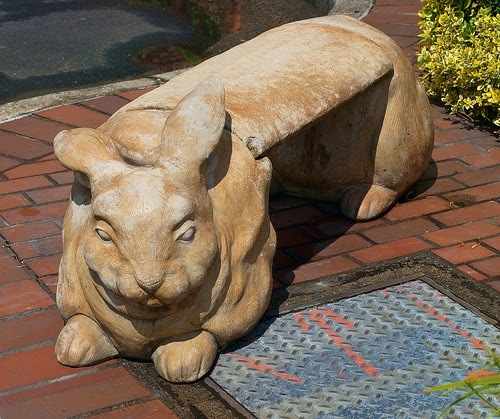 So here's a big strong concrete rabbit. He's a bench that can take plenty of weight. 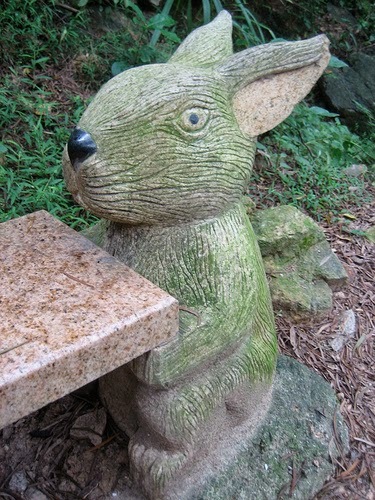 And here's a beautiful rabbit bench sculpted from stone. No problems there. I'm rabbiting on here. 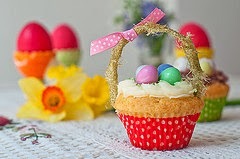 But of course Easter isn't just about fluffy bunnies and pretty decorations. It's about the Easter story . . .
and fresh starts . . .
. . . and giving up things for Lent. Yes, April, I've noticed that this Easter bunny is smoking. No, May, I don't think we ought to chase him off the bench. The girls are getting just a tiny bit restless now.They need a cupcake break. Or how about a white chocolate bunny bench? June says she doesn't like the snow in this one. No bunny should have to sit out on a snowy bench. Well, ok. How about a nice warm rabbit-log fire? The girls are in tears at the thought that these lovely log bunnies would get burned up. Sorry, girls. Sorry. I wasn't thinking. Of course we won't burn the log bunnies. Gosh, I'm walking on eggshells here. 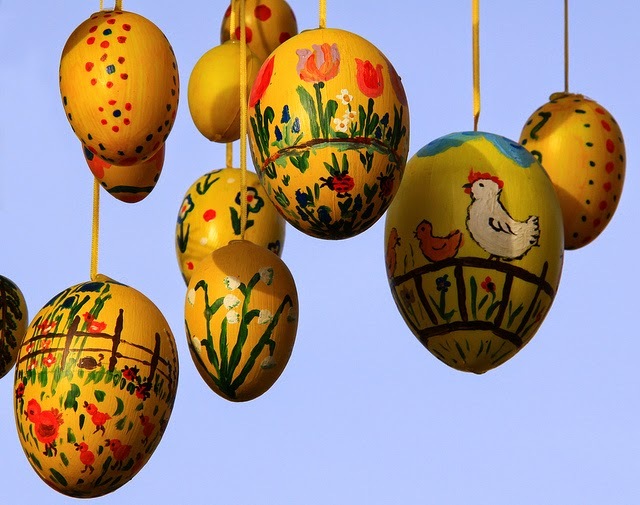 And speaking of eggs, here are some lovely Ostern eggs from Germany. The girls are squealing with delight at the beautiful eggs. Me too. 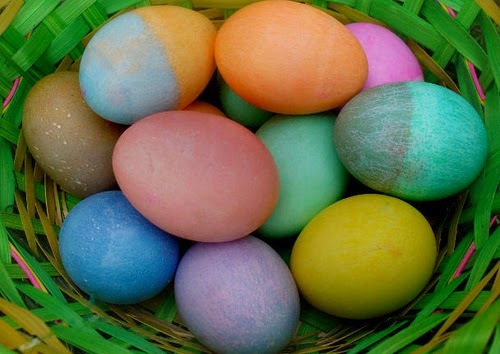 There's something so nice about painting Easter eggs. But April is saying we shouldn't put all our eggs in one basket. 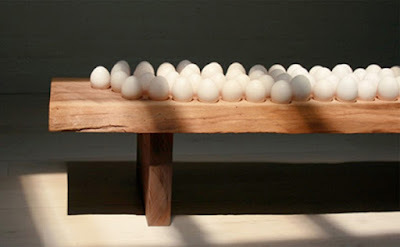 She thinks we ought to look at some other benches associated with Easter. Chicks for instance. 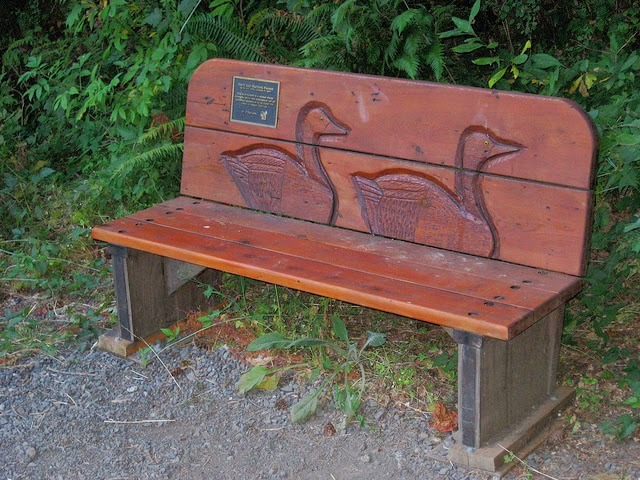 Here is a lovely crocheted chuk family on their very own bench. April is saying she'd like to see some chicken benches. May: Not just chickens on benches. Well, sorry, girls, but chicken benches aren't as plentiful as rabbit benches. 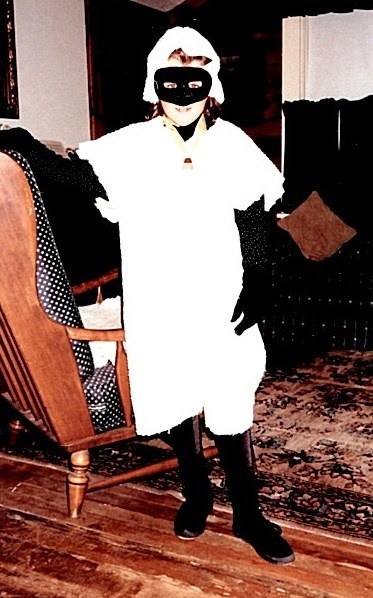 Yes, you're right, June; this is Colonel Sanders. He's much associated with chickens, but maybe not for all the right reasons. The girls are hopping mad. How about we start again with lambs? The girls don't trust me now; they think they might get fleeced. Miggy's niece Lettie is no stranger to ovines. 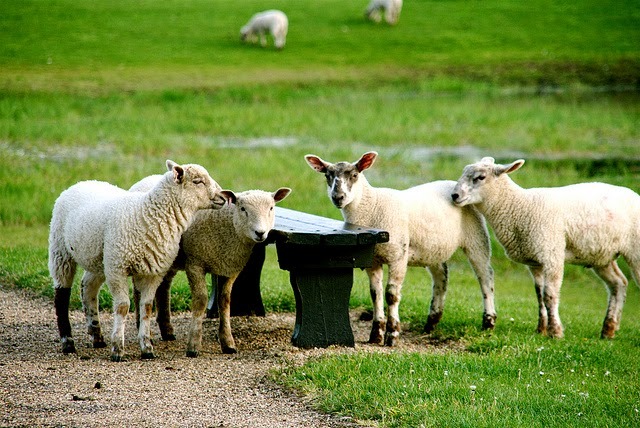 She has already done a whole blog about baaaad sheep benches for me. Yes, you're right, girls. Lamb is not just for Easter. Keeping well away from the subject of m-e-a-t, let's look at some Easter ducks. 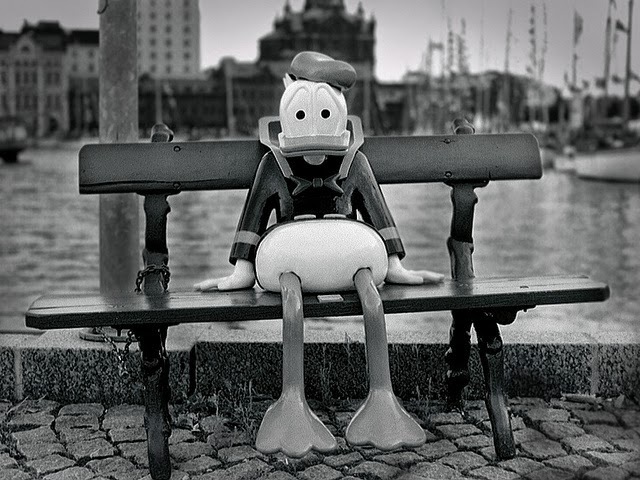 Here's Donald on a bench in Helsinki. April thinks he looks miserable. He's not having a happy Easter. Alright, what about this little fellow then? The girls feel sorry for this poor little duck. April is weeping, May is wailing, and June is sobbing her heart out. It has all ended in tears. OK, here we go, girls. Look, I'm not trying to duck out of this. Here's a nice duck pair. They're together, paddling happily along the back of the bench. June says this bench is too dull for Easter. 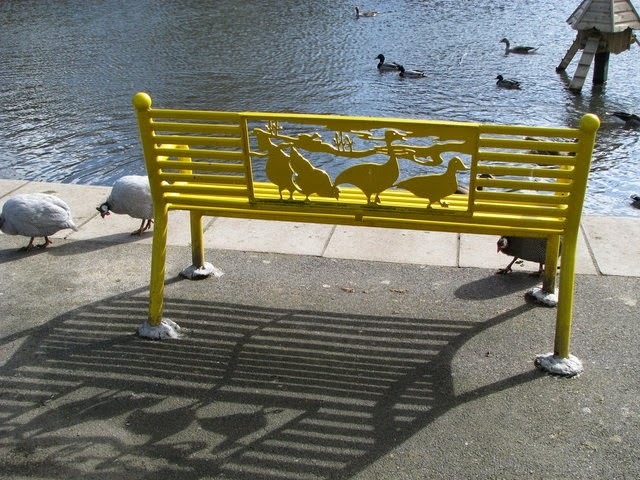 She wants to see a nice bright Easter-coloured duck bench. April and May aren't so bothered. It's water off a duck's back to them. 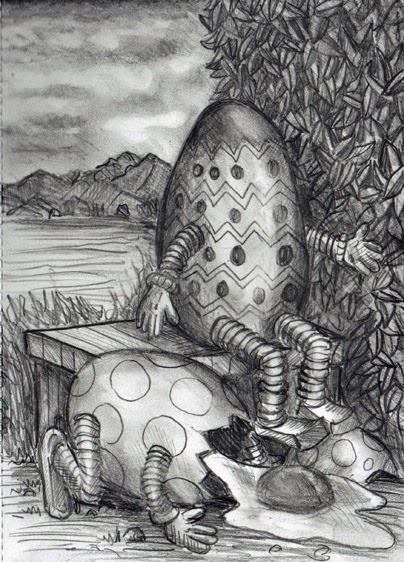 We hear the rustle of an Easter basket and a very surprising rabbit turns up with a basket of chocolate bunnies. Thanks, Innocent. You came along just in time. The girls dive into the basket and feast on chocolate. Before you know it, the little Easter bunnies are nothing but piles of shiny paper. And Innocent has a new dress with a chocolate ribbon belt. The fashion forums are unkind, saying things like they hope it will melt away. 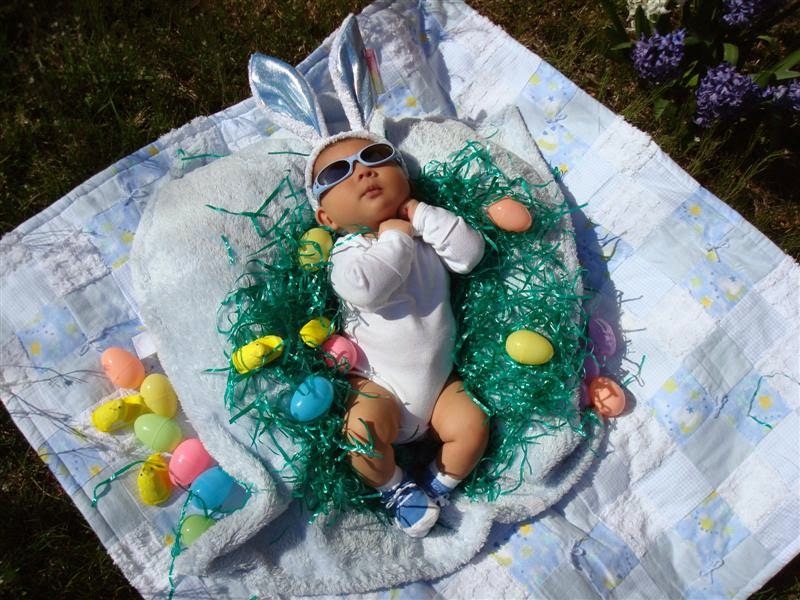 Innocent has had quite a hard time finding a dress this Easter. She has sacked her designer, Joop, from Overbearing in Holland and is creating the designs herself. Her first dress was this one, which fashion forums described as The Easter Bunny in drag. 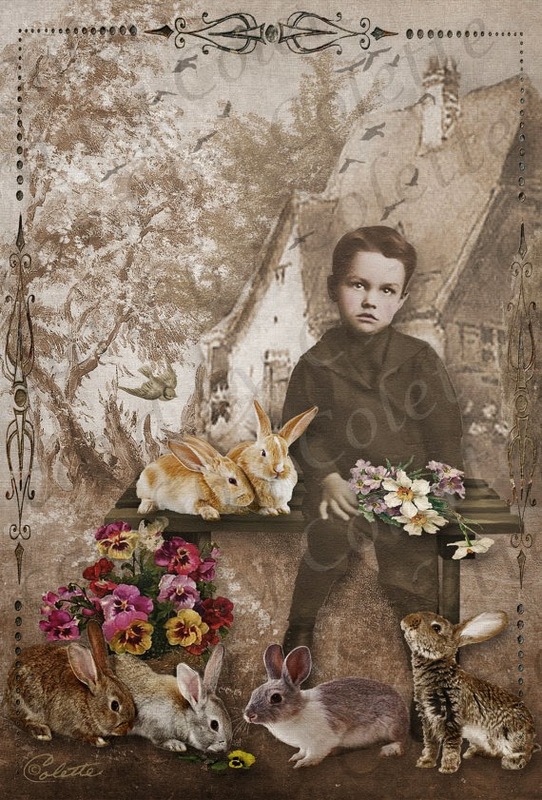 April: Maybe Innocent has become something like the Mad March hare? May: Queen of Silly Dresses. June: We dare not speak her name. Word has got round that Lady Brassica is going to wear lavender with yellow for Easter. 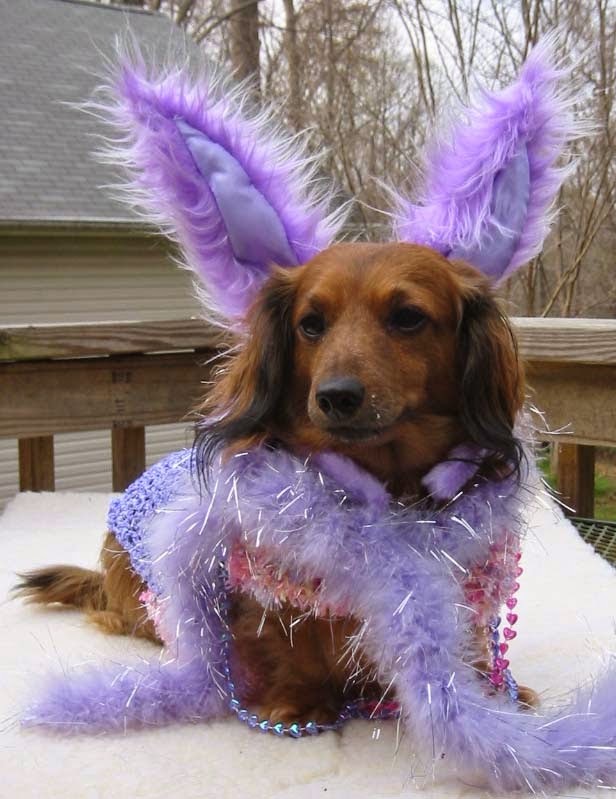 Tamsin, ever keen to be fashionable, turns up in what can only be described as The Wrong Colour Purple. While the girls are sitting on a bench by the river I ask them what's the best thing about Easter. I thought they'd say something like not going to school. Or dressing up. When I was a child we used to love wearing an Easter hat. We dressed up for church in our pretty new dresses. But things have changed and priorities are different. 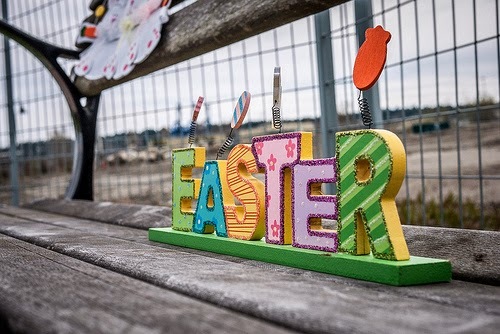 April says she is looking forward to the Easter races when the girls drive their cars along the benches on the seafront. May says the best thing about Easter is boys. Apparently a lot of boys come to Paradise Island with their families at Easter. 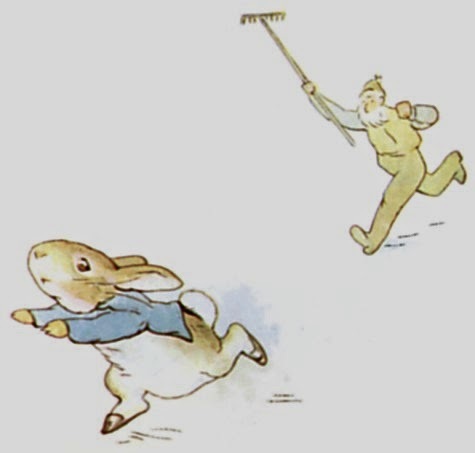 May says she is going up on Watership Down to look for a boy she met last year. 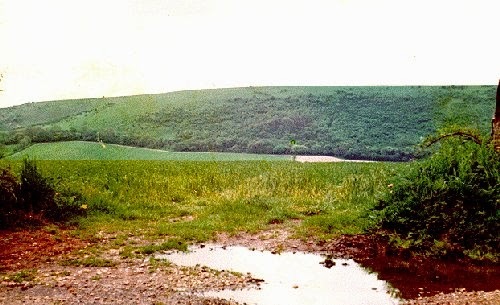 Name of Warren. 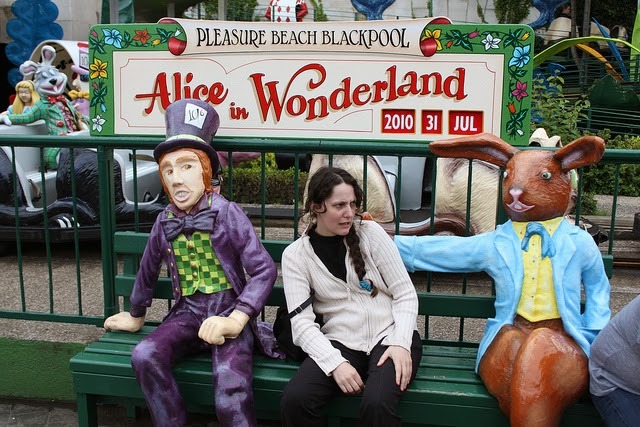 And June says she wants to sit on a bench with a nice boy and his rabbits. I tell her she needs to be careful. Rabbits disguised as bunnies can take advantage of unsuspecting chicks. A word of advice, girls: don't hesitate to tell a randy rabbit to keeps his grubby paws off you. So now it's Easter and people are making their way to St. Asphyxia's for the Easter service. Cora and Dora started at 5 am and have only got as far as the village bench, even with PC Willie Wyme there to hurry them along. 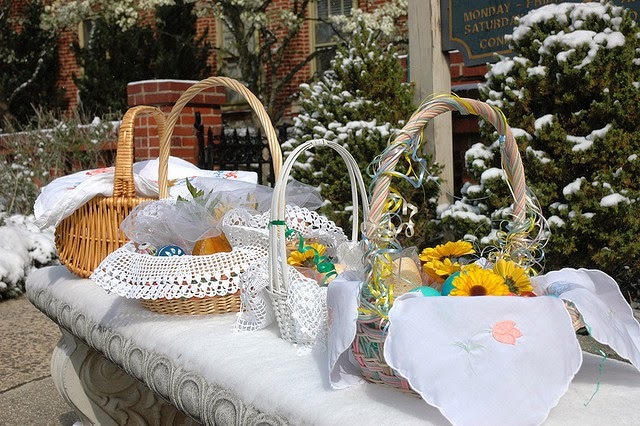 On Easter morning Innocent looks around for inspiration and finds the flowers that were delivered to Drizzly Manor. Rather hurriedly, she wraps herself in the plastic that comes off the flowers. And when I say wrap, you can see what I mean. Her friends from Easter Island keep smiling but they are not the least bit impressed. And then Lady Brassica steps out in a dress from her fashion house in County Offhand in Ireland. Designed by Lady Jess and hand-crocheted by the good parish ladies of Ballyfrumpy, the dress is an instant success. The animals too are in their Easter hats. Chick has chosen a very nice pink hat whilst Tonks the horse prefers straw; first you wear it, then you eat it. Come on now, children. Grab your Easter baskets. I've hidden lots of Easter eggs in my garden. April? May? June? 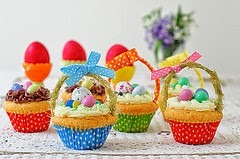 Don't you want to hunt for Easter eggs? But it's nice to see that at least one bunny girl takes Easter egg hunting seriously. The European rabbit (Oryctolagus cuniculus) was introduced into Britain more than 2,000 years ago during the time of the Romans. Rabbits are thought to bring good luck and indeed rabbits are extremely prolific: in 1859 just 24 animals introduced into one location in Australia resulted in 600 million rabbits a hundred years later. In 1953 the disease myxomatosis wiped out 99% of the UK rabbit population but now in winter there are about 40 million rabbits, rising to as many as 300 million in summer. They are one of the most frequently seen wild mammals in Britain, and one of the most loved. If you doubt it, you should have seen me hopping around through thousands of rabbit and bunny photographs to make this blog. April, age six, lives here in Fribble-under-Par with her parallel selves, May and June. The girls always turn up together to community events and are among the very few children here on Paradise Island. They love Tamsin's baby, Isambard, and they have a pet lemon called Squeezy, who looks a little sinister but maybe he's just a sourpuss. Innocent has emerged from her convent nursing dress into something of a fashion icon. But just how innocent is Innocent? Just a couple of weeks ago in the Springy Yellow Bench post she turned up to a party in rabbit ears and ended up dressed as a Mexican flag. 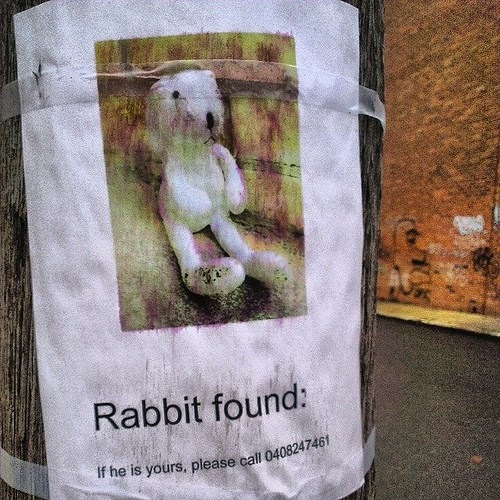 Is this a bit of fun or a careful strategy to unnerve the Easter Bunny? 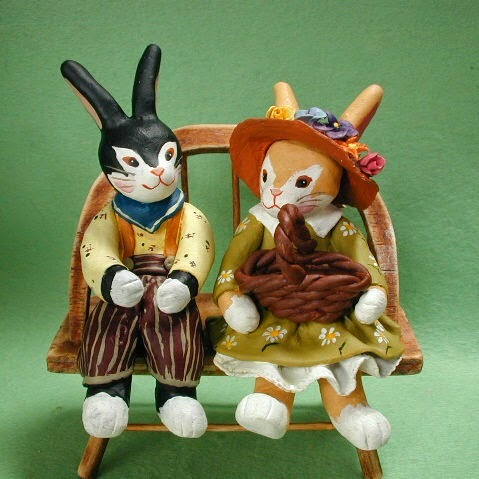 Shintaro Oda in Japan runs Clayworkshop with his wife Kaori, who makes lovely clay figures like the rabbit couple with their shopping basket. Judging from their photostream, Kaori and Shintaro like gardening, spring blossom, and very nice little clay figures on benches. 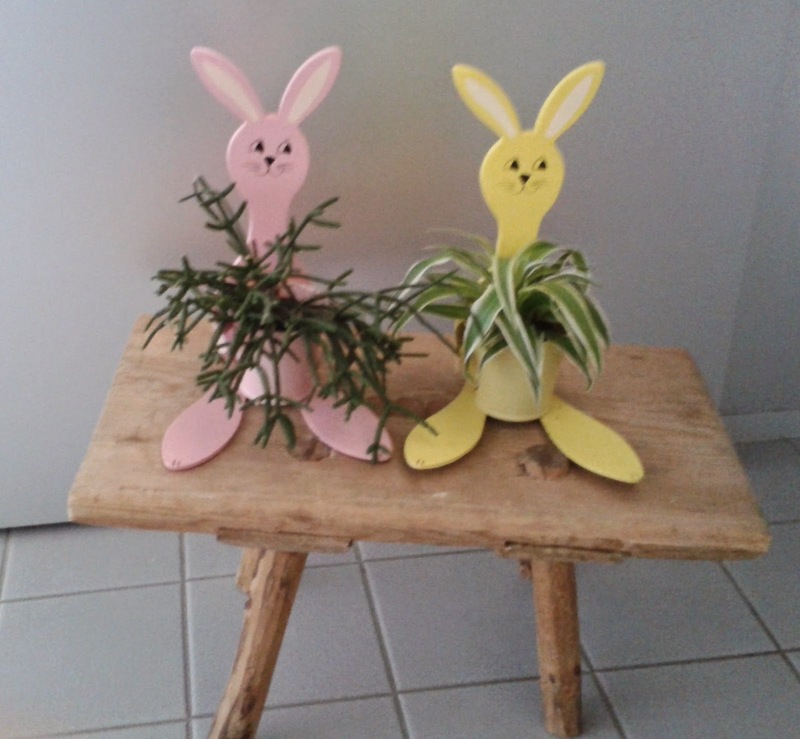 https://www.flickr.com/photos/clayworkshop/ I thought this well-dressed couple made a perfect pair for Easter. KingKong911 loves taking pictures and sharing her photos. 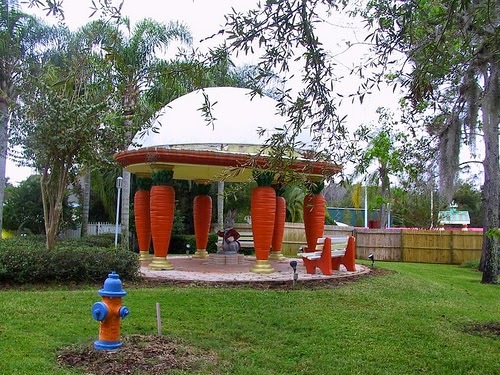 https://www.flickr.com/photos/sonypic/ She took the photo of the Rabbit and Carrot Benches in the park back in 2008. The park was (is still?) in Kissimmee, FL. 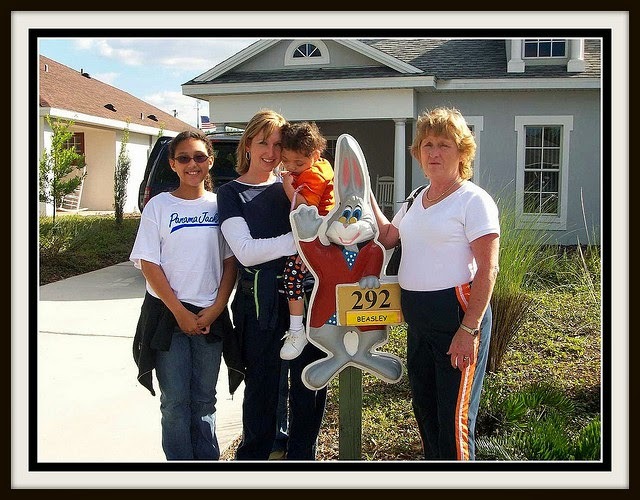 KingKong and her daughter and granddaughter went to the Give the Kids the World fair in Kissimmee, and stayed at a house with this rabbit mailbox. The loving rabbit couple are from www.spi-home.com There are lots of cute animal lovers on benches around but this couple are convincingly love-struck. They have appeared on Benchsite before. In fact, they were inspirational when I met my imaginary husband Mungo and we decided to get married in Las Vegas on the spur of the moment. Well, it wasn't a rash judgement: we had met that same morning and had a few hours to consider it. 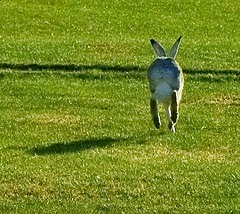 You've heard of Mad March hares? It's true that the hare was once the MacBeth of the British animal world: even saying the word hare was considered unlucky. A 13th century verse lists 77 names to avoid saying its name. Now, however, the hare is considered a noble creature and there are around 800,000 of them in the British countryside. 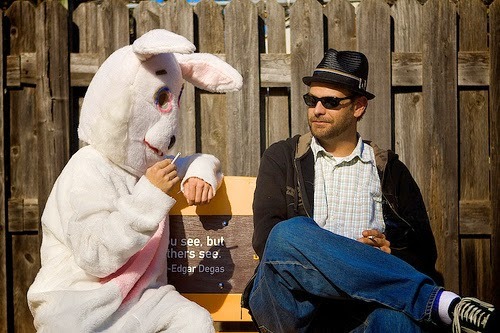 Paul Souders is axoplasm, a web designer living in Portland https://www.flickr.com/photos/axoplasm/ He likes taking pictures of people and pets and little statues like the rabbit holding up all the benches in the park. Axoplasm notes that sadly, most have lost their ears, hats, tails, etc. Patrick Scholl is a cartographer living in Wismar in Germany. 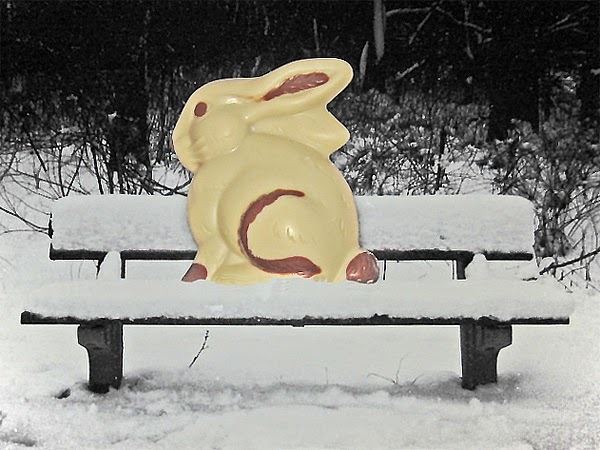 He specialises in photographing the German autobahn network but on this occasion he has made a photomontage of a rather delicious-looking chocolate rabbit on a snowy bench. http://www.autobahnatlas-online.de/ and https://www.flickr.com/photos/patrickscholl/8604617848/ Frohe Ostern! If this isn't enough snow for you, have a look at the Snowvenian benches we had this winter; they're Frozen. I really did have a hard time finding good chicken benches. 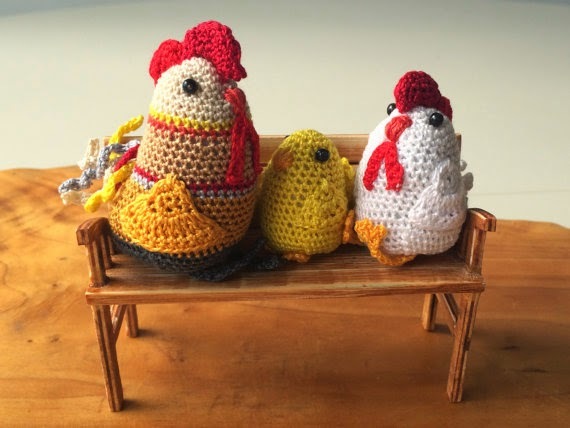 Anat and Gila from Israel made the lovely chuks family - rooster, chicken and hen - on a bench together in fellowship and love. Their shop features lovely crocheted stuff - chickens, of course, but also bears and stuffed dolls. According to Anat and Gila, there is nothing like a hen house to say "I really really love you!" Sheila Roper from Ipswich runs Severine's Attic, an etsy shop full of vintage postcards and ephemera. 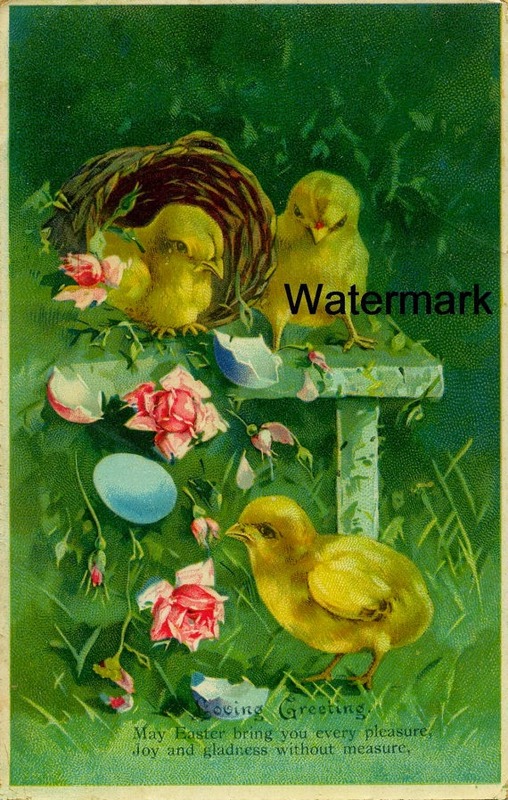 https://www.etsy.com/uk/shop/SeverinesAttic There are many beautiful vintage Easter cards, including the newborn chicks playing on a bench. With a purchase from Severine's Attic you can save the image to your computer and print out multiple copies for your own use. They're ideal for scrapbooking, decoupage, altered art, greetings cards etc. 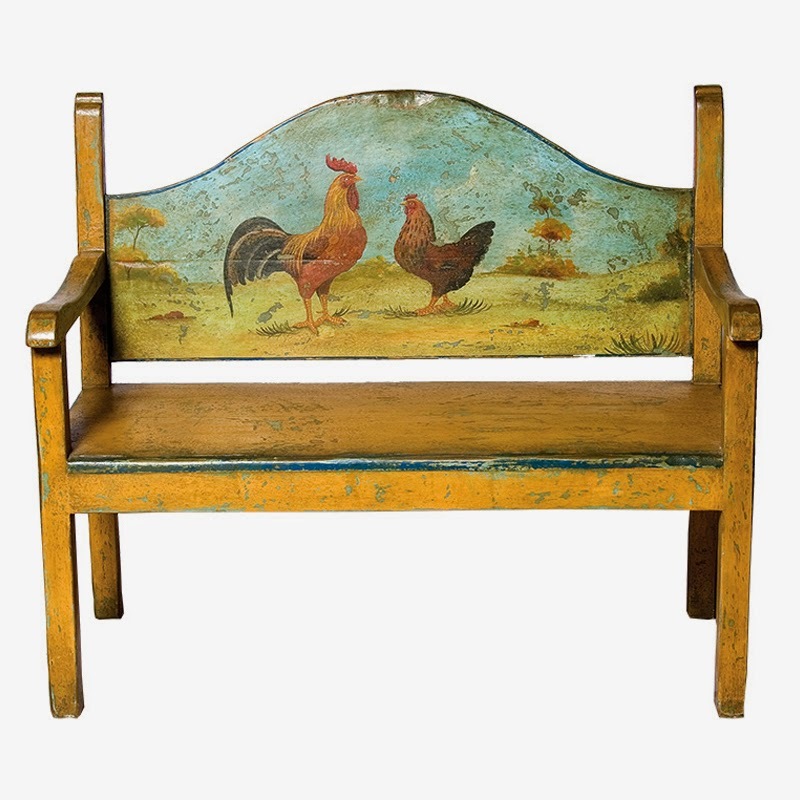 The charming rustic rooster and chicken bench is from www.bellesscape.com in Los Gatos, California. http://belleescape.com/painted-country-rooster-hen-bench.html The bench features a special hand-painted rooster and chicken design on the back rest. The papaya finish has been lightly distressed to add an antique feel. It's available for $2,295.00. Belleescapes has just about every kind of chic furniture you can imagine: farmhouse, industrial, cottage, bohemian, cosmo, Provence, vineyard and even shabby chic. Cottage style? They've got coastal, earthy . . . I'll stop there. You can have a look for yourself. Jimmy Wayne Emerson lives in Dalton, Georgia. He enjoys travelling and photographing county courthouses and post offices. As a personal mission he has set out to visit all 3,143 counties or county equivalents in the United States. 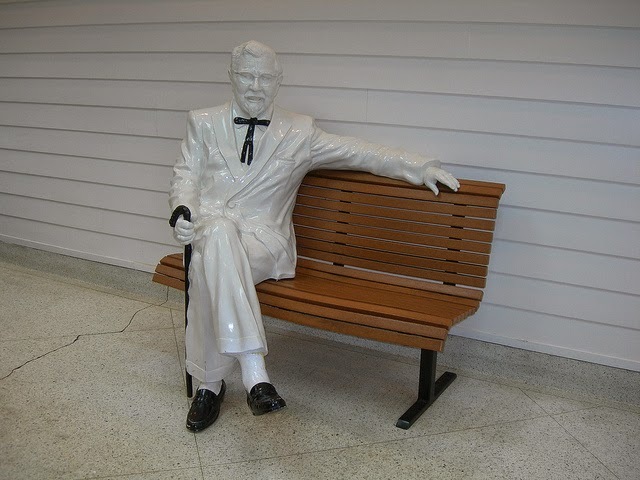 On a visit to Corbin, Kentucky Jimmy also photographed Colonel Sanders on his bench at the Colonel Sanders museum https://www.flickr.com/photos/auvet/5094669843/ Corbin is where Harland Sanders established his diner in the 1940s, and which became finger lickin' good across the world. Lettie is the niece of my imaginary friend Miggy. 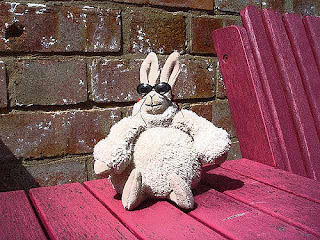 Lettie comes from a family of sheep and turned into a sheep herself at the age of eight. She has a good eye for sheep, lambs, wool, and all things ovine, which is why I let her help me with the Baaaaa Sheep Bench post. Unfortunately, Lettie is rather critical of my own sheep bench designs and after a lot of tears and Words, I decided I would never again work with children. Now here I am again with April, May and June, getting into another mess. Come to think of it, working with cats is just as bad as working with children. And as for working with monkeys . . . The best luck I've had on Benchsite is working with unicorns. Jake P Johnson is from Bristol. 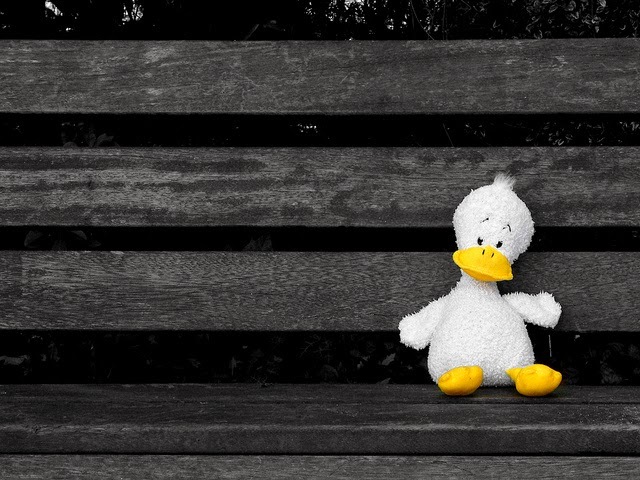 He took the photo of the lonely little duck on a visit to Bath https://www.flickr.com/photos/jakepjohnson/5526245589/ He also has a great black and white picture of people sitting on a bench overlooking the Clifton Bridge in Bristol. This is a favourite bridge view seen before on the Benchsite Bridges post. 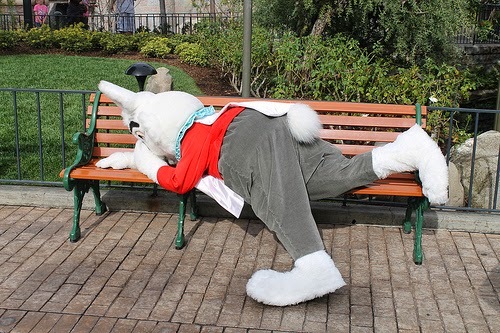 Loren Javier lives in LA and photographed the crying rabbit on a bench. http://www.flickr.com/photos/lorenjavier/ I think it's crying, isn't it? Maybe it's just resting? Loren has an annual pass at Disneyland and he has loads of photos from Universal Studios too, including a whole collection of Norman Bates and the Bates Motel. That's why he's been on Benchsite before; if you want to have the wits scared out of you, see the spine-tingling Halloween post. 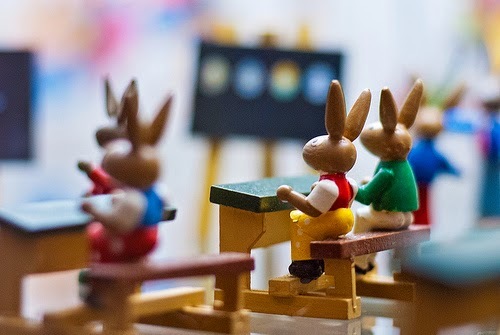 The wonderful Wednesday in Easter Bunny School was photographed by Markus Reinhardt, a software engineer from Forchheim in Germany. https://www.flickr.com/photos/tuxxilla/ It uses the blurring Bokah technique in photography; apparently egg bokah is quite popular as a way of creating an abstract image. 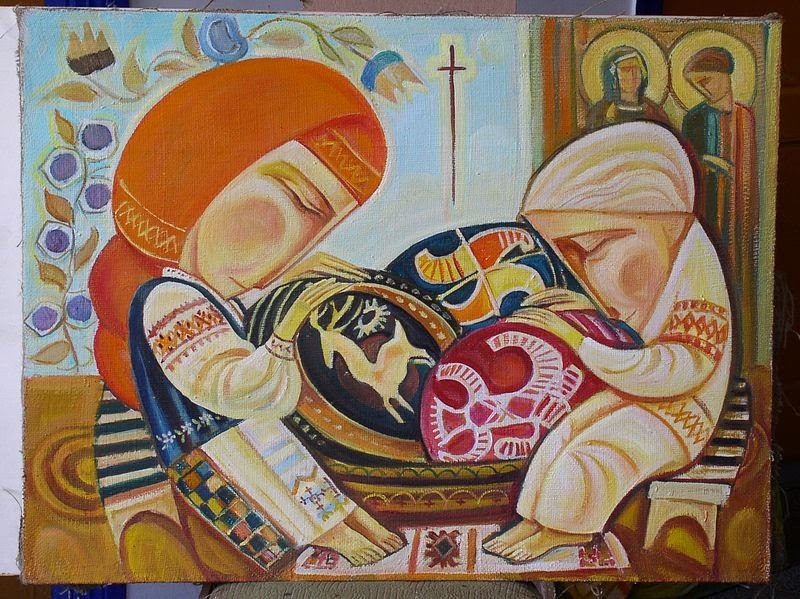 Pamela Silin-Palmer is a decorative artist, fine artist, and illustrator who now lives in Ireland. She makes magical paintings, greeting cards, dolls, paper products, and glorious hand-painted fantasy furniture. 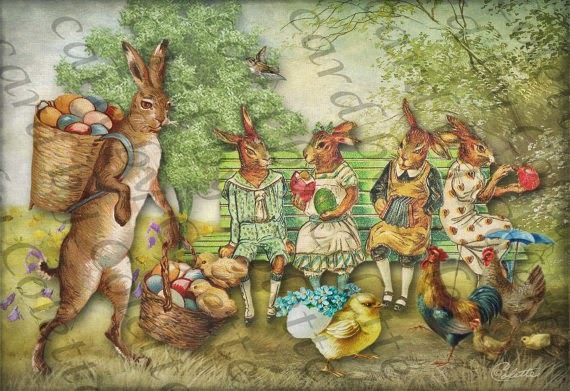 From renaissance rabbits to royal boars, her website is full of fun and fantasy - a real delight! www.pamelasilinpalmer.com In a previous Benchsite story Pamela's rabbit and sow benches were lucky enough to make it onto Noah's Ark in time for World Animal's Day. Her Bandito Bench features in the long and intriguing story of Mexican Benches. Leo Reynolds, from Norwich, has been taking photographs for many years. 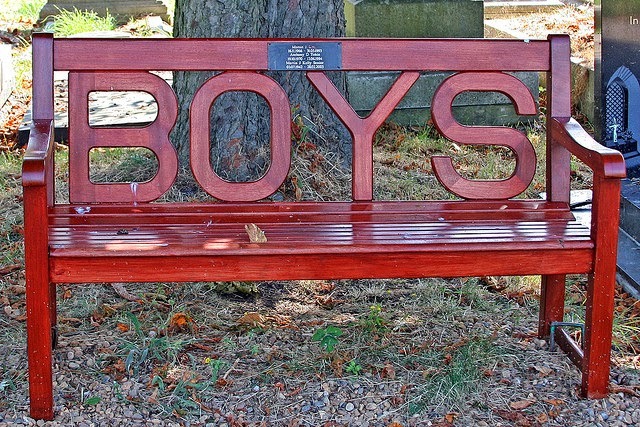 He photographed the Boys bench in Kensal cemetery in London. https://www.flickr.com/photos/lwr/555901199/ Leo is a geek after my own heart. His photostream is incredibly well organised into labelled and categorised sets. Among them are selfies, stick figures in peril, vintage graphics, and, of course, benches. I'm fascinated by it all, especially 1,141 photos of the letter E. And if this isn't convenient enough, you can get all the letters of the alphabet, and numbers, organised by colour. Oh bliss. Finding a site like this just makes my day. Sandra from Hemet runs Romeo Loves Rose, an etsy shop with many vintage art and illustrations that can be used for scrapbook work, decoupage, or printed out to make signs, gift and note cards, totes, or even add a printed square to a baby quilt. 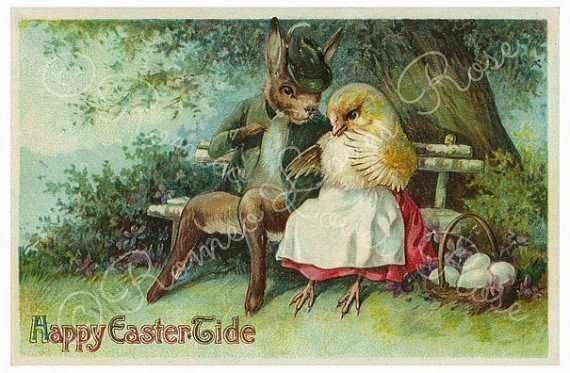 One of her greeting cards is the suspicious-looking rabbit who is sitting on a bench beside a rather vulnerable-looking young chick. 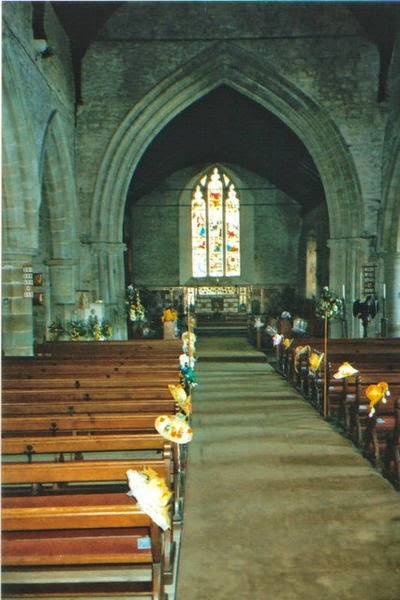 Sandra has loads of cards for Easter, plus vintage frogs and dogs. This is a picture from my garden at La Casa Perfecta. The garden at La Casa is rather splendid, but it depends on which way you are looking. For the good, the bad and the ugly perspectives on my house and garden, see Welcome to La Casa Perfecta. I live in the Casa Perfecta in the town of Fribble-under-Par, which is on the lovely Paradise Island. I am lucky enough to have two husbands - one imaginary and one real. I have two beautiful cats and a dog named Sit. I also have lots of delightful friends. 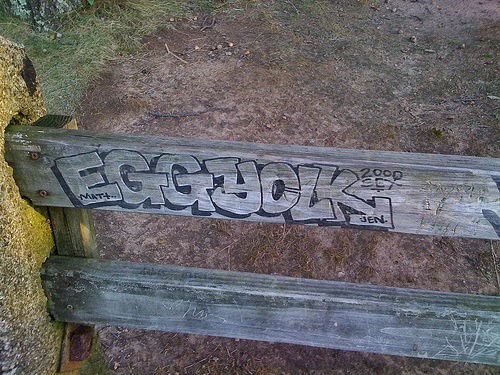 Despite all this, I spend far too much time on the internet looking at benches. OMG this is the coolest blog ever!!!! Is this blogger creative or mad as a box of frogs? It's always great to see Eddie. Hilarious! I can't make any sense of this blog. What are you on about? Copyright remains with the original owners of text and photos and copyright applies to all photos and text. You may use my photos if you credit the benchsite blogspot. If you are using someone else's work, you need to contact them. Every effort has been made to credit photos and other materials to their rightful owners but if there are any inaccuracies or omissions, do get in touch. Donations of your own bench photos are always welcome.